Yes, that's right, you are looking at Beth and Elle sitting on the floor and listening to Barbara Bush read a book. This occured when Elle had to go in for her next round of chemo on Monday. 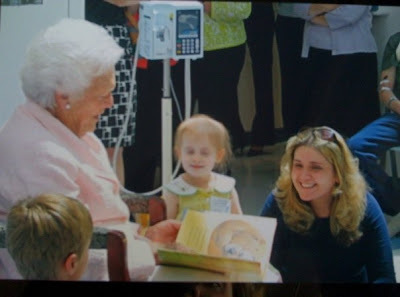 They got into the hospital around nine that morning and were informed that Mrs. Bush would be arriving around 11. So Beth gave Elle a quick primer on how the hospital was named after her and that Monday was her birthday. Elle then took it upon herself to write out a birthday card for Mrs. Bush. When Mrs. Bush arrived with her Secret Service contingent, she came by and talked with the different patients and their parents. Then it was time for Mrs. Bush to read to the kids. You can't see it in the picture, but Elle is holding her birthday card for Mrs. Bush. After the reading Elle gave it to her, which Mrs. Bush appreciated very much. And then there was birthday cake. So Elle was eating a piece of cake and about halfway through, she decided she was done. Beth had stepped away for a second, so Elle turned to the nearest adult...a Secret Service agent. She looked up at him, extended the half-eaten cake and said to him, this agent with the gun, the suit and the earpiece, "You can take this, I'm done." The agent willingly took the cake from Elle to throw away. Beth rushed over to apologize but the agent said he didn't mind at all. Apparently he didn't mind the line of frosting he got on his sleeve either. Chalk up another convert to Elle. But that wasn't all. After the agent came back he said to Elle "Aren't you the perfect little princess?" Elle smiled sweetly and answered "I know", which elicited smiles from the whole Secret Service contingent. No matter how tough you are...you stand no chance against Elle. That set the positive tone for Elle's stay. Her chemo went so well that she got out a day early, which weren't expecting at all. Now for the rest of July she gets a vincristine push once a week. And she needs some filgrastim shots this week, which Elle isn't fond of in the least. The rest of the week went very well for her. And Elle and Davey got to sleepover at Beth's parents last night, which they always enjoy. So it was a great week for Elle. Some great day, when this is all in the past, Elle will read all of these amazing stories you're posting and it will be an amazing joy for her. Prayers continue, of course. ..."Maybe we'll get an invite to the compound this summer..."
Elle can convert the entire Bush clan to Democrats.